1895 Loeffler Sausage Advertisement | Park View, D.C.
Here’s a nice old ad from 1895 for Andrew Loeffler, manufacturer of sausages. 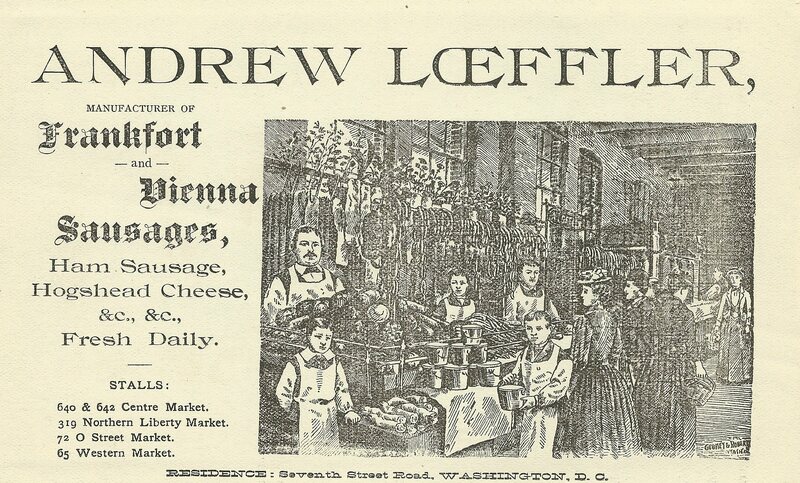 The ad clearly shows that Loeffler sold his provisions locally at the Centre Market, Northern Liberty Market, O Street Market, and the Western Market. I also like that it notes his residence was on Seventh Street Road. I’ve posted a brief history of Loefflers Sausage and Provision company before, which was located roughly on the southwest corner of today’s Georgia Avenue and Quincy Street — just across the street from the Georgia Avenue Metro station. This entry was posted on July 16, 2014 at 7:01 am and is filed under History. You can subscribe via RSS 2.0 feed to this post's comments.